Never argue with a referee or assistant referee. 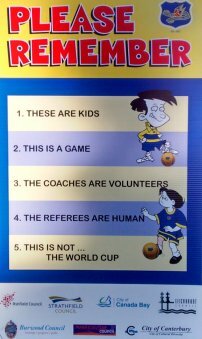 If you disagree, have your captain, coach or manager approach the official on your behalf. Control your temper. Verbal abuse of officials and sledging other players, deliberately distracting or provoking an opponent are not acceptable or permitted behaviours in football. Be a good sport, recognise all good plays whether they are part of your team or the opposition. Treat all participants in football as you like to be treated. Do not bully or take unfair advantage of another competitor. Cooperate with your coach, team-mates and opponents. Without them there would be no game. Respect the rights, dignity and worth of all participant regardless of the their gender, ability, cultural background or religion. Support all efforts to remove verbal and physical abuse from all of football’s activities.